There's always a degree of skepticism you should bring with you when looking at "premium" AV cabling. A high price tag and the promise of gold-plated connectors won't necessarily bring you any greater performance benefits than if you'd just settled on a budget cable. But the Marseille mCable Gaming Edition is promising something different. 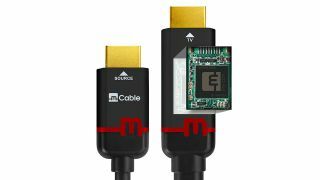 By including its own embedded video signal chip in the cable itself, it claims to be able to improve the anti-aliasing capabilities of your games. Supporting framerates up to 120fps and resolutions of 1920 x 1080, it applies a post-process AA algorithm to your games to smooth out otherwise-jagged edges of characters and environments. PCPerspective have been testing the cable and claim it lives up to its promises, with a "noticeable difference in image quality". It may well be the one situation where a more pricey cable is worthwhile, with no added input lag noticed by the testers. "Gaming consoles have a problem: they can't draw very well," reads the Marseille description. "Even if they're high powered, they still miss a lot of key details because all processors are physically limited, leading to insufficient sampling resolution and framerate, which leads to common 'artifacts' such as jagged edges and shimmering textures." The note of 'gaming consoles' being the target is an important one. While PC gamers may see some slight benefits, most titles already offer powerful anti-aliasing techniques within their set-up screens. In addition, saving the money spent on an expensive cable and using it for more powerful components would have a sure-fire performance improvement. For console gamers, however, it could be a real draw. You're looking at $119 (about £90 / AU$ 150) asking price for a 3-foot cable, $129 (£100 / AU$165) for a 6-foot one and $139 (£105 /AU$180) for a 9-foot version.